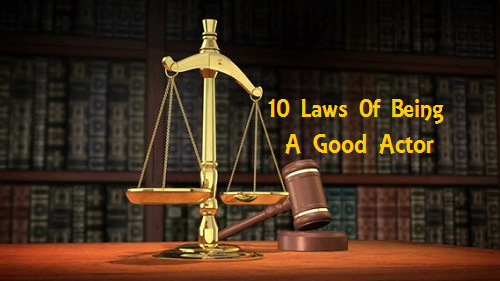 """ keywords'/> "" " Acting Wisdom: 11 Industry Laws To Be A Good Actor | Best Actor Academy-The Monster Of Free Acting Tips ""
Too many actors accept and settle for being good when they have the potential to be great. When you’re just starting out and you don’t have many credits of roles in films, TV serials or commercial ads , don’t dream and ask for the lead roles. There’s nothing wrong with aiming high, but you can’t lose yourself in the clouds. Actors spend way too much time talking about themselves and expressing their opinion on others without being asked. Try keeping quiet every now and then, especially when you’re talking to people in the industry. Be a good listener. Who knows? You might actually learn something. Don’t believe everything you hear. You know the actor who met in the audition room who’s half as talented as you but claims he got the role with Deepika Padukone in a feature film. Or a pseudo-producer / director who offers you a role with security money. They are lying. You don’t have to jump on every opportunity that comes your way. Ask this question to yourself “will it be good for my future or present?”. Accept Rejections. They aren't personal. Perhaps they wanted just another person. Your ego doesn’t control your life. Others do not have the power to crush your dreams. Only you can do that. Never give up come what may. Success for an actor is a long struggle. Be patient. Make arrangements for a long journey.